There are some plants that are so showy in the garden they are worth budgeting a little extra summer water. They really get your attention.That plant for me is the hydrangea. Want instant drama in the garden? Plant one of the many hydrangea varieties. All have flowers so large they can’t help but steal the show. Easy to grow, they are pest and disease free. Here are some of my favorites and how and when to prune them. 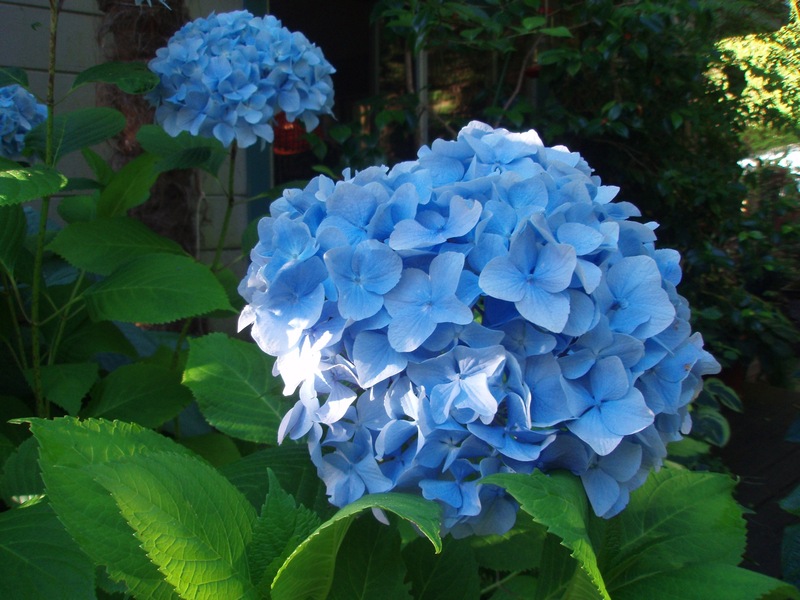 Back in 2001 a new variety of hydrangea macrophylla was introduced. Called Endless Summer it has the unique ability to re-bloom throughout the spring and summer on both current and older season wood resulting in a much longer blooming season. This was great news for me because as sure as the sun rises, a heat wave would descend upon my garden in May and many of my traditional mopheads and lacecaps would crisp up and the show would be over way too soon. With Endless Summer I get continuous flowering through the summer. How do I prune this variety to get the most blooms? When you read care instructions about pruning any hydrangea and they refer to new and old wood it’s really just another name for a stem they are talking about. New stems growing this growing season will be green. Old stems that grew last year are brown. Prune Endless Summer hydrangeas as needed to keep them symmetrical. Remove dead stems you are sure will not be leafing out this year. To revitalize a mature plant-about 5 years old- remove about a third of the oldest canes in the spring by cutting them as close as possible to the ground. If your plant looks fine, leave it alone. You can prune off spent flowers in August but I prefer to leave the flower heads on the plant for winter interest. Classic bigleaf hydrangeas -hydrangea macrophylla- mostly bloom on last years stems or old wood. The proper time to prune them is right after blossoming in July or August. Again I like to leave the dried flower heads on for fall and winter color so I prune lightly in late summer and again now lightly to shape. I may be cutting off some potential flower buds by pruning now but those stems usually flower by early fall and I’m not wacking back the whole plant. If your bigleaf hydrangea doesn’t bloom well any more it may be time for more drastic measures. Cut back non-blooming stems to about 6 inches high. This will stimulate the growth of news productive stems. Another showy hydrangea with huge pyramidal flowers is called hydrangea paniculata or Pee Gee hydrangea. With chartreuse blooms, Limelight is one of my favorites. They tolerate drought better than other hydrangeas which is another plus. Because they bloom on new wood in midsummer into fall, prune them in winter or early spring. Cut away old flowers and prune to open the plant to sunlight. 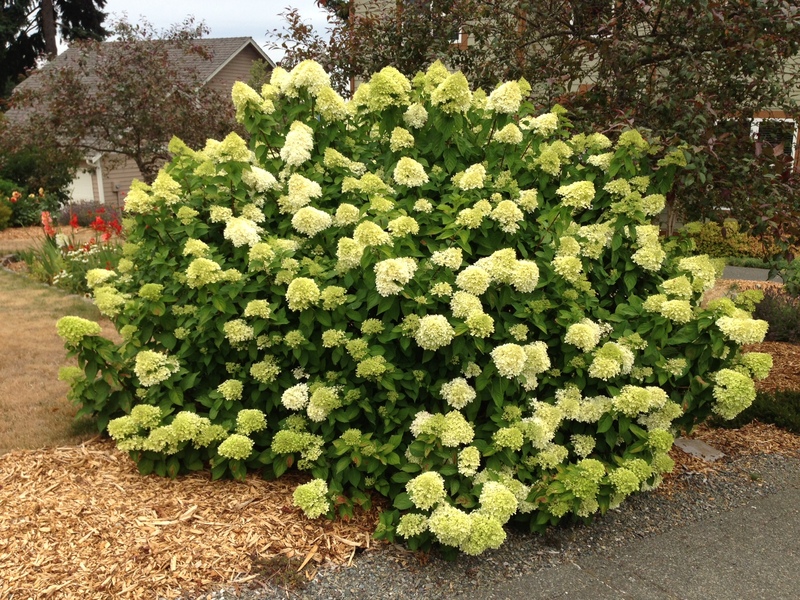 Hydrangea arborescens like ‘Annabelle’ produce enormous white flowers and also bloom on new wood during the summer prune during the winter or spring. This is the variety you see grown as hedges. I think I need one of these in my garden. 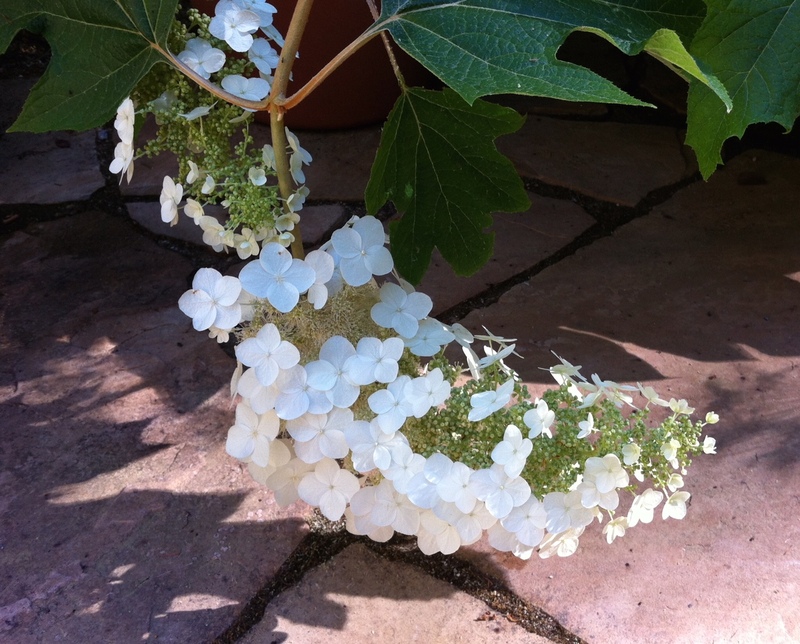 Vying for attention in my garden is the oakleaf hydrangea or hydrangea quercifolia. I love this plant because it is so versatile. I often include it in a landscape design because it is easy to grow in a variety of situations from deep shade to mostly sun and it tolerates some drought. The stunning summer display of elongated, creamy white flower clusters age to pink by autumn and then papery, rusty brown in winter. But it’s the fall display of handsome leaves that resemble oaks that will get your attention. Mine turns the color of bright burgundy but I’ve seen bronze and crimson color on others. Prune them in early summer right after flowering. Even in our coldest winters, hydrangeas in our area are easy to grow and don’t suffer winter damage to the flower buds as those in snow country do. Lucky us. I’m looking forward to my hydrangea show which will last most of the year.